Al Maniscalco interview Coming Soon! Al Maniscalco has been making strong contributions to the mid-Atlantic jazz scene since moving to Baltimore in 1993. Born in Staten Island, New York and raised in Hollywood, Florida, Al migrated north to Maryland after receiving his Bachelor of Music degree in 1992 from the University of North Florida. In 1994 he completed studies to earn a Master of Music degree from Towson State University. Now hailed as one of the regions top saxophonists, Al has achieved a substantial resume, including performance with Branford Marsalis, Tony Bennett, Valery Ponomarev, George Colligan, Curtis Lundy, Billy Hart, and Chuck Mangione. And has shared the stage with such popular favorites as The Temptations, Hal Linden, The Guy Lombardo Orchestra, The Shirelles, Little Anthony and the Imperials, and on International Cruise Lines. 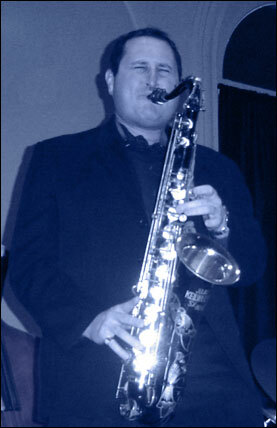 In 1992, Al Maniscalco was selected WINNER of the Jazz Category in the Great South Florida Sound Search, sponsored by the Miami Herald, competing with over 600 contestants. Since its inception in 1994, the Al Maniscalco Quartet has developed a reputation as one of Baltimore’s premier jazz groups, performing at every major jazz venue in the greater Baltimore area. This continued success led to the production of the group’s first major recording project, and the release of their first CD, Altitude, in 1997. The year 2000 was marked with the second recording by this ensemble. Al Maniscalco: Live at Tidings Park captures the musical growth and camaraderie of the Al Maniscalco Quartet. Recorded live at an outdoor summer concert, the band reaches new levels of expression to a wonderfully receptive audience. Al Maniscalco has now released his third recording as a leader, under his own label, Jalkoda Records. More in My Heart is the most expressive and emotionally charged recording by the Al Maniscalco Quartet to date. Al Maniscalco is expanding his audience worldwide, as recent performances in Hong Kong and Italy have proven his appeal to an international audience. As his popularity in the U.S. grows, plans to return to Europe and Asia are eminent. Al Maniscalco currently resides in Baltimore, Maryland, where he maintains a steady schedule of performing as well as private instruction. He serves as adjunct instructor at several area schools and colleges and is an active clinician. Many of his former students have gone on to realize their own success in the music world. Aside from leading the Al Maniscalco Quartet, he is in great demand as a sideman with many of the region’s top bands in all styles of music. The thing that is making jazz healthy today is that people are coming out of other backgrounds - from rock, folk, from ethnic music. It's changing the music, and for the better.